Ballet, Yoga, Zumba, Pilates classes (All adults classes taking break at the end of July/ August; starting again in September. ) please check with your teacher. click here to find out more about our opportunities for young choreographers and artists: work in progress sharing, residencies, volunteering opportunities and affordable rehearsal space. Abney Park: Back To Life! 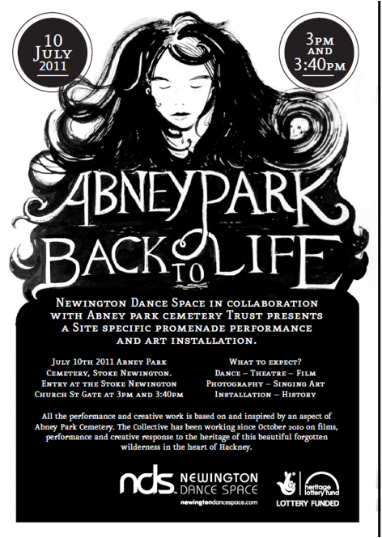 Newington Dance Space in collaboration with Abney park cemetery Trust presents Site specific promenade performance and art installation Abney Park: Back to Life. July 10th 2011 in Abney Park Cemetery, Stoke Newington. All the performance and creative work is based on and inspired by an aspect of Abney Park Cemetery. The Collective has been working since October 2010 on films, performance and creative response to the heritage of this beautiful forgotten wilderness in the heart of Hackney. Be part of an exciting performance. In our dance classes we fuse various styles of dance (ballet, jazz, modern) with a focus on fitness and creativity. We teach techniques as well as performance skills encouraging all to create and express themselves in new ways. The project will culminate in a public performance. Be part of it! summer break! we will be back in September. Well done to all our children for their performance on 2nd July!